Wooden Arrow have been around for a very long time. 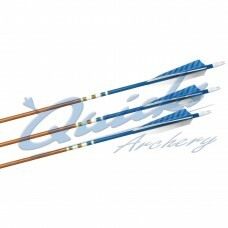 These days they are used for Longbow and Traditional archery as well as on the Field Course and for Fun and Leisure events. 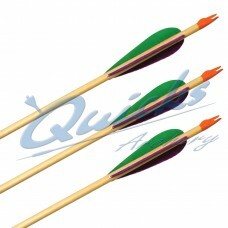 They range in quality from the basic arrow to highly matched and decorated top quality sets. 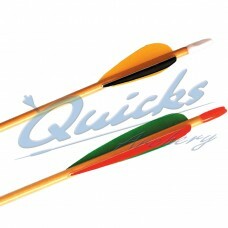 We stock a range of quality and styles as well as making up sets to your specification. 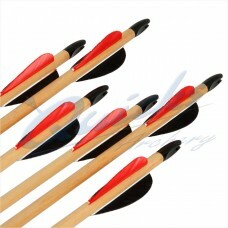 Wooden arrows should be tried by all archers to see how good they are. 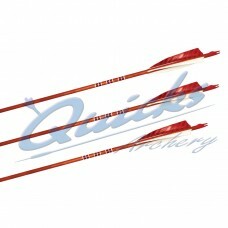 Longshot Deluxe Wooden Arrows Wooden arrows , made up with three feather fletchings, maximum..
Longshot Standard Wooden Arrows Wooden arrows for all sorts of shooting such as Longbow, Field..
Longshot Standard Wooden Arrows For Lighter Bows Wooden arrows for all sorts of shooting such..
POC Premium Shafting Hand Selected to make a best quality Wooden Arrow 5/16 and 11/32..
POC Premium Shafting to make a good Wooden Arrow 5/16 and 11/32 available in sharp looking..
POC Premium Shafting to make a good Wooden Arrow. 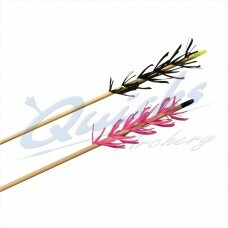 5/16 and 11/32 available in sharp looking..
Quicks Wooden Flu-Flu Arrows Big fletches to slow the arrow down quickly Features Wooden Arrow..